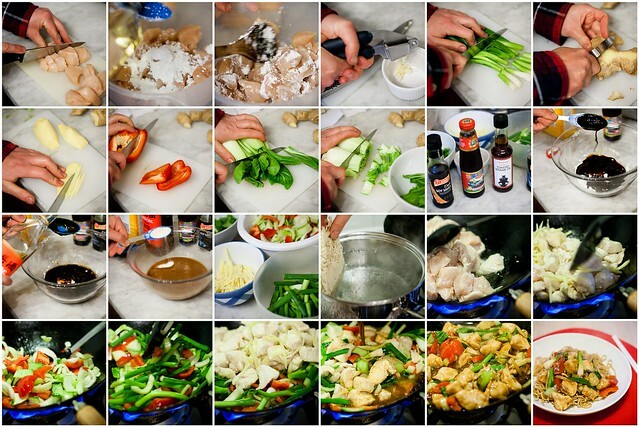 Wedding & Event Photography Blog of Simon Butler Photography: Let’s make…Chicken, Ginger & Spring Onions! 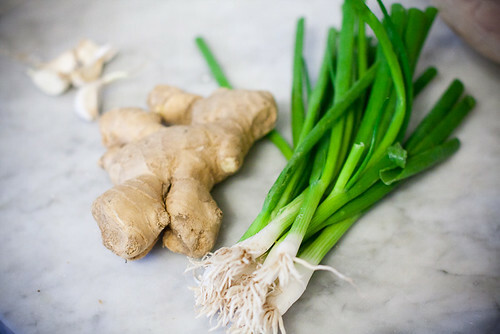 Let’s make…Chicken, Ginger & Spring Onions! It has been ages since I did a food blog on here. And I have meant for ages to try to make my own version of my favourite Chinese take-away dish of chicken, ginger and spring onions. So this evening I decided to kill two birds with one stone and do both. I searched the internet for a suitable starting recipe and was heavily influenced by the amazing nutsaboutfood version here. But I made some changes and I was thrilled with how delicious the end dish tasted. Just as good, if not better, than my local take-away! If you click on the recipe mosaic at the top of this post, or click here, you will be taken to an interactive recipe of how to make the dish. Once you get to my flickr, just hover your mouse over the mosaic to get instructions. Alternatively, here is the recipe. 1. Cut up chicken breasts into small bite-sized chunks. 2. Put the chicken in a bowl and add 2 tbsp each of corn flour and vegetable oil. 3. Mix and leave the chicken, flour and oil mixture for 20 mins or so. This will tenderise the chicken. 4. Crush the garlic cloves. 8. Slice off the green leaf tops from the pak choi and roughly chop the leaves. 10. Make the sauce. In a bowl, add the remaining corn flour, the oyster sauce and the soy sauces. 12. Bring a large pan of water to the boil and add the dried noodles and cook for the length of time on the packet (mine took 4 minutes). Once cooked, drain the noodles, put them back into the pan, add a dash of soy sauce and sesame oil, mix and keep warm until the chicken, ginger and spring onions is ready. 13. Meanwhile, heat a wok over a high heat until smoking. Add 1 tbsp of vegetable oil and add the chicken. Stir fry for a couple of minutes. 14. Add the ginger and garlic and stir fry over a high heat for 1 minute or so until the chicken is almost cooked. 15. 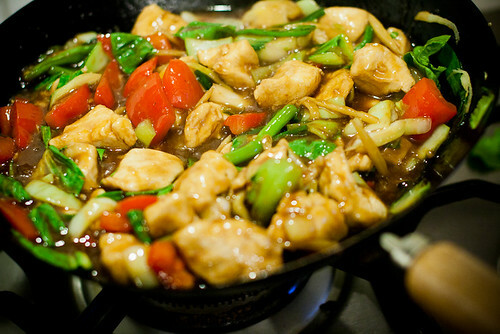 Remove the chicken, ginger and garlic from the wok and place into a large bowl. Wipe clean the wok with a paper towel and place the wok back onto the high heat. Add 1 tbsp of oil to the wok and heat until the oil is smoking. Add the peppers and the bottoms of the pak choi and stir fry for 2 minutes. 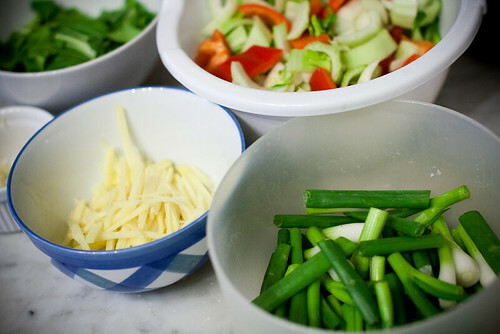 16. add the spring onions and stir fry for 30 seconds or so. 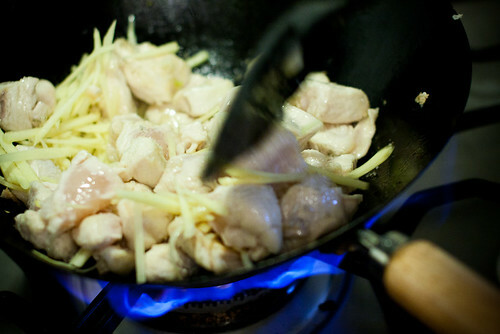 17. add the chicken, ginger and garlic back into the wok and mix. 18. Add the sauce, mix and let the sauce bubble and thicken over a high heat for a minute or so stirring to prevent the sauce from sticking. 19. Add the chopped pak choi leaves, mix them in and cook for a few seconds until the leaves have wilted. 20. 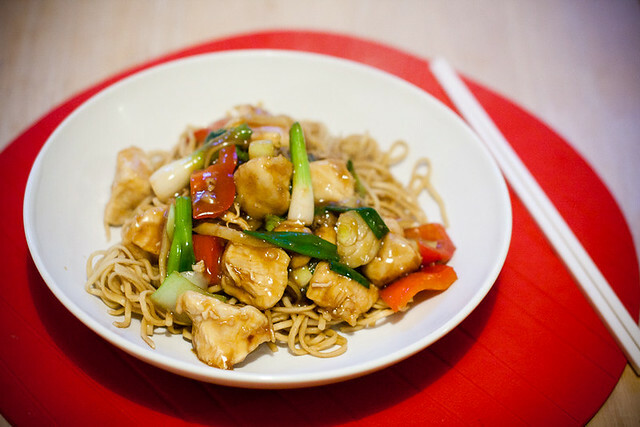 Serve the chicken, ginger and spring onions on a bed of the noodles and eat! Yum!